Join the Christ Cathedral campus staff as we come together to listen to Fr. Spitzer’s weekday Mass homily. 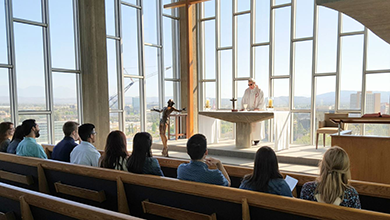 Audio is recorded during Mass in the Chapel in the Sky located in the Tower of Hope on Christ Cathedral campus. Fr. Spitzer Homily recordings are now hosted by OC Catholic. Please visit their website to hear Fr. Spitzer's amazing homilies. Father Robert Spitzer is a Jesuit priest, philosopher, educator, author, speaker, and retired President of Gonzaga University. 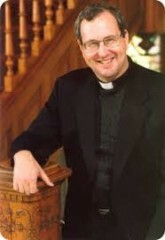 He has made many media appearances including Larry King Live (debating Stephen Hawking, Leonard Mlodinow, and Deepak Chopra on God and modern physics), the Today Show (debating on the topic of active euthanasia), The History Channel in “God and The Universe,” and a multiple part PBS series “Closer to the Truth.” Father Spitzer has published 6 books including his newest best selling book, “Finding True Happiness.” Father Spitzer is co-founder and President of the Magis Institute. Click here to see additional previous homilies!